At Dance House Productions we love and value our work. Our faculty strives to be the best instructors, dancers and choreographers possible. We take every opportunity to continue our education in the field of Ballet. We love sharing what we have learned with parents and students. Ballet is the foundation of Western Dance. We offer a mixed level class that will cover ballet fundamentals. These include the five basic positions of the feet, correct position of the arms and hands (port de bras), correct postion of the head, and the basic positions of the body (e.g. ecarte and efface). Students will advance within their own ability levels through intermediate barre exercises, center-work and progressions as they learn traditional steps and combinations involving Tendues, Piques, Sautes and Pirouettes. Dress Code: Dancers must wear a leotard (any style) with pink tights. Pink Ballet slippers must be worn on the feet. Hair must be worn in a bun. Ballet skirts, legwarmers and tight-fitting shorts are optional. Admittance to this class is by instructor approval only. Additionally, Pointe students must a minimum of two ballet classes per week. At the instructor’s discretion, students working up to Pointe may take the class “on flat” Pointe classe is intended for students with previous ballet training- for your child’s health and safety, we recommend that students have been taking ballet for multiple consecutive years, ideally since they were children. Students will utilize previously learned ballet technique while working in Pointe shoes. Exercises focused on strengthening the feet and ankles will be done each week. Other classwork includes barre exercises, center work, combinations, variations, and Divertissement. Dress Code: Pointe shoes. Dancers must wear a leotard (any style) with pink tights. Pink Ballet slippers must be worn on the feet. Hair must be worn in a bun. Ballet skirts, legwarmers and tight fitting sweatshirts are optional. This class is an introduction to Ballet and Tap. The total run time for this combination class is forty five minutes, an accommodation for young learner’s attention spans. For Tap, rudimentary steps will be shown accompanied by music so that children can develop rhythm, timing, and learn to count music while moving. For Ballet, the class will be introduced to the basic positions of the arms and feet (first through fifth for each) Basic movements such as tendues will also be learned. Pupils will also be introduced to the correct names for those movements. For parents of children in this class: Your child may need your attention from time to time for various reasons including bathroom or behavioral issues. We ask that you do not leave the waiting room when your child is in class- unless first informing the office and making arrangements to have another parent responsible during your absence. We make every effort to have all children feel safe and cared for in a loving and inspiring learning environment. Dress Code for both classes: Please, No jewelry and wear hair so that it is out of the face. Dress code for Tap: Clean sneakers that are worn only in the studio. Sneakers allow our instructors to better hear young dancer’s sounds. Tap shoes will be worn during the Recital only. Since Tap is first, please have your child in his or her sneakers at the beginning of class. Dress code for Ballet: Students must wear a leotard (any style) with any color tights. Pink Ballet slippers must be worn on the feet. Hair does not have to be in a bun, it need only be worn so that it is out of the face. In order to prevent property loss, we strongly suggest that Parents with children in this class attach their child’s name to tap shoes and any other footwear/apparel that they bring for this class. Did you know that there are several different schools of Ballet? There are. “Classical Ballet, duh!” we answer. Classical Ballet is the traditional style, with the main focus on academic technique wherein a detailed framework is followed. French, Italian, and Russian schools are the foundation of the traditional Ballet class that we know today. The French school is the underlying voice of all ballet training and is known for elegant movement as well as famous masters such as Pierre Beauchamp, Taglioni, and Saint-Leon. The Italian school was brought to its full height by Enrico Cecchetti, which is more commonly known as the Cecchetti method. Complicated steps, turns, and strong technique are specific points that define the Ceccehti method. Lastly, the Russian school was a clear product of the French and Italian schools as it absorbed what had come before and made it its own. Jean-Baptiste Lande was the founder of the Russian school, and it became known for superior agility and clean turns and jumps. Teaching methodology will draw specifics from the Russian, French and Italian Ballet traditions so students are able to gain a more broad-based knowledge and are able to recognize the difference and similarities between the three principle styles of Ballet. The main focus of the Ballet program will be on proper alignment and classical technique while increasing strength along with flexibility. A strong foundation is irreplaceable for a dancer, as it is the backbone of all dance forms. Freedom of movement will be gained and permissible with the level of the class. Having a strong knowledge of how each step is executed is very important in Ballet because each step relates or later becomes another step allowing there to be a continuous thread throughout the classes. Along with understanding how each step is executed comes a full understanding of the meaning of each step. For example, plie means “to bend.” The action of a plie is to bend one’s knees and can be done as a “demi-plie” or a “grande-plie.” Another example would be a frappe, which means “to strike.” The more clearly that each movement is understood, the more this clarity is reflected in the movement. Class structure follows a specific outline; barre, center work combinations, and variations. Barre is the set-up for the rest of the class and is a primary part of the ballet education. The techniques involved in Barre Work are the Plie, Battement Tendu, Battement Degage, Rond de Jambe, Frappe, Fondu, Grande Battement. “Wait, where’s the Center Work?” you ask, anxiously. “Of course there’s Center Work, don’t worry!” we admonish reassuringly. Center work allows growth and expansion of movement, which was founded at the barre. More movemenet occurs in the center, and technique that was applied at the barre is implemented in all work that follows. 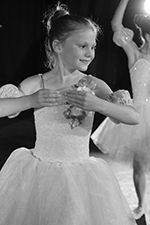 The techniques involved in Center Work are: Adagio, Center Battement Tendu, Pirouette, Waltz, Petit Allegro, Grande Allegro, and Coda. All of the above are part of the traditional ballet class. This structure is designed to maintain and develop technique and a certain aesthetic or artistic value. The class is structured to start with the plie and end with big jumps, gradually picking up speed and intensity when the dancer is warm and ready. Ballet class will follow the same structure each week in order to prepare the student to perform choreography at the year end recital. Any classical ballet heavily involves every aspect of the class to transition over into the steps. Some examples would be Coppelia, Swan Lake, The Nutcracker, Don Quixote, and The Sleeping Beauty. Additional work in class will include Combinations, Variations, and Divertissement – short dances within a ballet. These are examples of technical elements and combinations of technical elements that would be pulled from any assorted ballet and learned in either a class setting or a separate class designed only for learning variations or divertissements. “Is there anything I need tell my son or daughter about Ballet?” you inquire, while looking up our studio address on your smart phone. We concede to answer this last question, but then we really have to get to the grocery store before it closes for the night: one of the greatest things about ballet is that it can constantly and continually be fine-tuned. That alone is stressed throughout every level and every ballet class. It is not adequate to just be able to do a specific step – the importance lies in executing it correctly. That is the most significant value to have when approaching the technique. If you are interested in Ballet lessons here at Dance House productions, call us now at (207) 282-6769, or complete the form below and one of our instructors will be in touch right away!